106, 107. Ancient Greek inscriptions from the hill of Aetos, Ithaca. 108-111. Ancient Greek inscription from Perachori, Ithaca. 112. 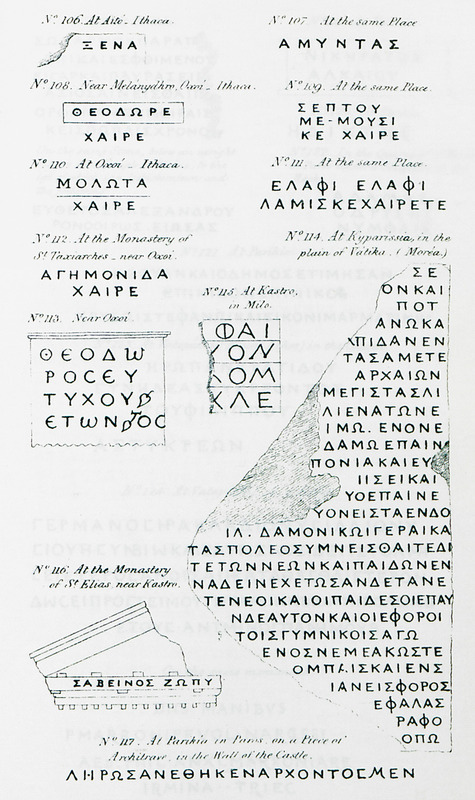 Ancient Greek inscription from the monastery of Taxiarches, Perachori, Ithaca. 113. Ancient Greek inscription from Perachori, Ithaca. 114. Ancient Greek inscription from Kyparissia, Peloponnese. 115. Ancient Greek inscription from the castle of Milos. Island Ancient Greek inscription from church on the hill of Profitis Ilias, near the castle of Milos. 117. Ancient Greek inscription from the castle of Paroikia, Paros.